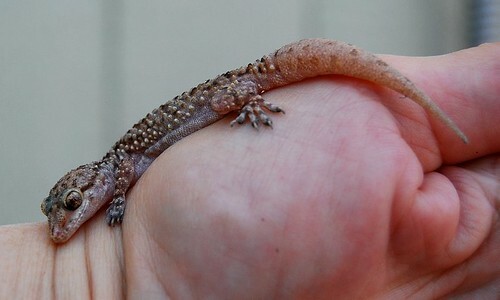 *whimper* Our geckos don't trust me that much. What a great picture! This guy was hibernating in the foam thing over the hose spigot. I took the foam thing off and the gecko fell into the bucket beneath it. I poured out the water and picked the poor little guy up. It cuddled my hand until I gently put it back in its foam house and carefully reattached the foam thing to the spigot. I'm going to put a note on it to remind me that there may be a gecko inside. Oh! His tail! It's so fat I just want to pinch it! do you think that is a replacement tail? I think it may be a replacement tail, but I've never seen one so fat. I wonder if that's not fat stored for hibernating. He's so cute. I wonder if you got a bunch of those foam cups and attached them along ther house, would geckos move in and it would be like bluebird houses along a fence line? That's a fun idea. Maybe when I move out to the land I'll try it.